The image is a thumbnail of an apology printed in yesterday’s Irish Mail on Sunday; click through for a full-size twitpic by David Cochrane. It is headed “Brian Cowen”, and it consists of four paragraph. The first paragraph (which consists of a single sentence) begins by referring to their story (update: which is no longer available at this link) of Cowen’s attendance at the Executive Education Programme at Stanford University which has been the subject of two earlier posts (here and here) on this blog, speculating as to the strength of Cowen’s possible complaint to the Press Council of Ireland and the Office of the Press Ombudsman that article invaded his privacy. The Sunday Independent yesterday reported that Cowen’s complaint had indeed been submitted, that it had drawn a robust response from the Irish Mail on Sunday, and that it was being considered by the Press Ombudsman. Where appropriate, the Ombudsman seeks to mediate a resolution to a complaint, and, if the Sunday Independent is right that the matter was before the Ombudsman last week, then this apology may very well be the product of such a mediation process. The second paragraph in the apology (which also consists of a single sentence) says that Cowen has made it clear that he paid for the course entirely out of his own resources. The original article had said that “Stanford had hosted 60 chief executives from Irish IT and life science companies under the Enterprise Ireland leadership for growth programme, all subsidised by the Irish taxpayer”. This, of course, led to speculation about whether EI were funding Cowen’s course, and although it was quickly made clear that he was funding the course himself, the implication must clearly have rankled with Cowen. However, any complaint about this aspect of the Mail’s article is one as to the accuracy of the piece, rather than as to whether it had invaded Cowen’s privacy. The third paragraph in the apology consists of two sentences, one of which says that the report was illustrated with a photograph of Cowen at a lecture, and the other of which says that Cowen had attended the course in a private capacity. Unlike in the previous paragraph, the issues in this paragraph are indeed related to privacy, and formed the basis of the discussion between Jonathan McCully and myself. I was strongly of the view that Cowen is still a public figure, that this course built on his time as a public figure with a view to his possible return to public life, and that the public interest justified publication not only of the story but also of the accompanying photographs. Jonathan equally strongly took the other line, that Cowen no longer holds public office or follows a public career, that the photographs of Cowen on a private campus, at lunch, and in class, were essentially of a private nature, and that there was no public interest in publishing either the article or the photographs. Nevertheless, whilst I think it interesting that the apology only refers to one of the photographs, rather than to all of them, given that the Mail has published an apology, Jonathan’s analysis must have been closer to the mark. We apologise to Mr Cowen for this publication. The apology does not seem to be available online, but the original story (without any correction or apology) still is has been deleted. It seems that, despite the apology, I will always know what you did last Summer, Mr Cowen, but there are now question-marks over just how much of what I know invaded your privacy. 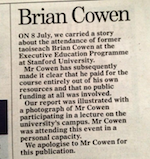 I know what you did last Summer, Mr Cowen, and in fact we all know what you did last Summer, Mr Cowen, because the the Irish Mail on Sunday reported on your enrollment in the Executive Education Programme at Stanford University in California. However, it is now clear that you would prefer that we didn’t know, that you consider that the Mail‘s coverage infringed your right to privacy, and that you intend to complain about this to the Press Council of Ireland and the Office of the Press Ombudsman. I’m glad you are looking to pursue this matter before the Ombudsman and Council and not in the courts, but I do not think that your complaint is likely to be upheld. I know what you did last Summer, Mr Cowen. Indeed, as you are a public figure, I am entitled to know what you did last Summer, Mr Cowen. … where a person holds public office, deals with public affairs, follows a public career, or has sought or obtained publicity for his activities, publication of relevant details of his private life and circumstances may be justifiable where the information revealed relates to the validity of the persons conduct, the credibility of his public statements, the value of his publicly expressed views or is otherwise in the public interest. 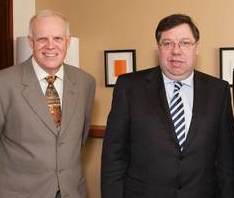 According to this morning’s Sunday Independent, former Taoiseach (Prime Minister) Brian Cowen (pictured far right) is to make a complaint to the Office of the Press Ombudsman that his right to privacy was unjustifiably infringed by newspaper coverage of his time in Stanford last Summer. Of course, when the Sunday Independent sought a comment from Mr Cowen about this development, the traditional “source close to Mr Cowen” last week gave the even more traditional reply: “No comment”. Unsurprisingly, the Sunday Independent considers it “likely” that the Mail‘s publishers “will robustly defend any complaint taken by Mr Cowen on the grounds of public interest”. A decision by the Press Council on this matter is likely to clarify exactly how the Council understands the public interest in the context of politicians. Although Mr Cowen has at present stepped back from front line public life, as a former Taoiseach, he is still a public figure – indeed, he undertook the course in preparation for a possible return to the law or to political life. As a consequence, I would not be sanguine about the former Taoiseach’s chances of success. 5.5 Taking photographs of individuals in private places without their consent is not acceptable, unless justified by the public interest. Since Stanford is a private university, it may seem that publication of those photographs is a breach of principle 5.5. But that would be too mechanical an interpretation of a private place. For example, Cowen was regularly photographed as Minister and Taoiseach attending sporting events. Strictly, the stadia in which such events occur are private property, but could not sensibly be described as private places. Similarly, although Stanford’s campus is private property, in my view it cannot sensibly be described as a private place. The same is probably true of the lunch restaurant, but photographs from the classroom are closer to the difficult borderline. But even if the classroom photographs are on the wrong side of the line and constitute an infringement of privacy, if publication of the story is justified as in the public interest, then publication of the classroom photographs would also very likely be justified by the public interest. Finally, it may be that he intends to complain that some of the Mail‘s reporting was not so much an invasion of privacy as misleading in significant respects. If so, then this is a breach of Principle 1 of the Code, which requires that newspapers strive at all times for truth and accuracy in their reporting (1.1). Crucially, unlike principle 5, there is no public interest justification for a breach of principle 1. The Ombudsman and Press Council were set up by the print media and recognised by the Minister for Justice under the Defamation Act, 2009 (also here) to provide a means of resolving disputes without recourse to the courts. I’m delighted to see such a prominent figure choosing to deal with the matter in this way, and I look forward to the outcome of the case. One of the most entertaining pieces of evidence that Lord Justice Leveson heard during his inquiry’s hearings into the culture, practice and ethics of the press concerned UK Prime Minister David Cameron‘s understanding of the popular sms abbreviation LOL. He had thought it stood for “lots of love“, and had used it to sign off his texts to Rebekah Brooks (sometime Editor of the News of the World, and the Sun, and CEO of News International), until he discovered that it in fact stands for “laugh out loud” (see transcript for 11 May 2012, p76 (pdf)). Given his rejection on Thursday afternoon of the main press regulation recommendations in Lord Justice Leveson’s Report (also here), published on Thursday morning, he is obviously laughing out loud at the Leveson Inquiry, not showering it with lots of love. 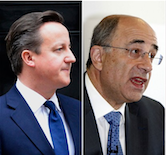 In essence, Leveson recommends that the press ought to be overseen by an independent self-regulatory body, with statutory underpinning, and governed by an independent Board. In so doing, he is adopting the basic structure of the Press Council of Ireland and the Office of the Press Ombudsman which were established by the media industry in Ireland and given statutory recognition pursuant to section 44 of, and Schedule 2 to, the Defamation Act, 2009 (also here), and described in great detail by John Horgan, the Press Ombudsman, to the Inquiry. Unfortunately, Cameron misdescribed the Irish system in the House of Commons last week (see Hansard 29 Nov 2012 Columns 446-482). Of course the Defamation Act, 2009 runs to “many, many pages” – it is, after all, an Act of 44 sections and 2 Schedules. However, it is not confined to providing a mechanism of statutory recognition of the Press Council; rather, is a restatement of the entire law of defamation in Ireland; and given that scope, it is in fact a model of economy of language. More to the point, the provisions relating to the Press Council and Press Ombudsman run to less than three pages. Hence, if the Commons does take up Cameron’s challenge of “studying the Irish situation and asking whether we want to have legislation of that extent on [the UK’s] statute book”, then a study of the Irish position demonstrates the Leveson recommendations can be implemented not with complexity but with brevity. The essence is that those who would judge or regulate others should look first to themselves. On Wednesday, when Senator David Norris (pictured left) introduced a Privacy Bill, 2012 into the Seanad, the debate focussed largely on media invasions of privacy, with little recognition of the massive privacy issues attendant upon the modern regulatory state and increasing law enforcement powers (to say nothing of widespread private surveillance or the aggregation of data by private corporations). All of the contributors to the debate were quick to behold the privacy mote in the eye of the media, and that they do not consider the privacy beam in their own eye: they are quick to criticise media invasions of privacy, but they are far slower to perceive the potential for the State’s invasion of its citizens’ privacy. Worse, it wasn’t even a particularly good debate. With the recent publication by the Press Council and the Office of the Press Ombudsman of their Annual Report 2010 (Report (pdf) | Press Release), it is an opportune time to consider whether the system of press self-regulation by those two bodies is working. I think that, overall, the answer must be yes. Within the remit afforded to the Ombudsman and Press Council, they are working very well indeed. The Ombudsman and Council are energetic in spreading the word about the speedy form of redress which they operate; the growing numbers of member-periodicals show that the industry has embraced the system; and the numbers of complaints show that an increasingly-aware public are taking advantage of it. Apart from the figures, 2010 saw two very important developments: the recogition of the Ombudsman and Council pursuant to the Defamation Act, 2009 (also here); and the extension of their remit to purely online publications. This has been no mere formality, but a significant and public recognition of the degree to which these new structures, since their institution in 2007, have met the exacting requirements laid down for recognition in the Act, and have contributed to the climate of enhanced accountability and public service within which our press industry operates. 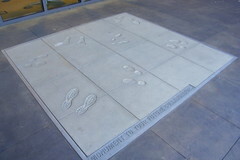 It is the final step in a long, but stately and carefully choegraphed, dance, which began with the publication of the Report of the Legal Advisory Group on Defamation in 2003, and proceeded via the establishment by the press of the Ombudsman and Council, through the publication of the Defamation Bill, 2006 and its enactment in 2009, to this recognition. Perhaps emboldened by it, the Ombudsman and Council are becoming more visible and more muscular.